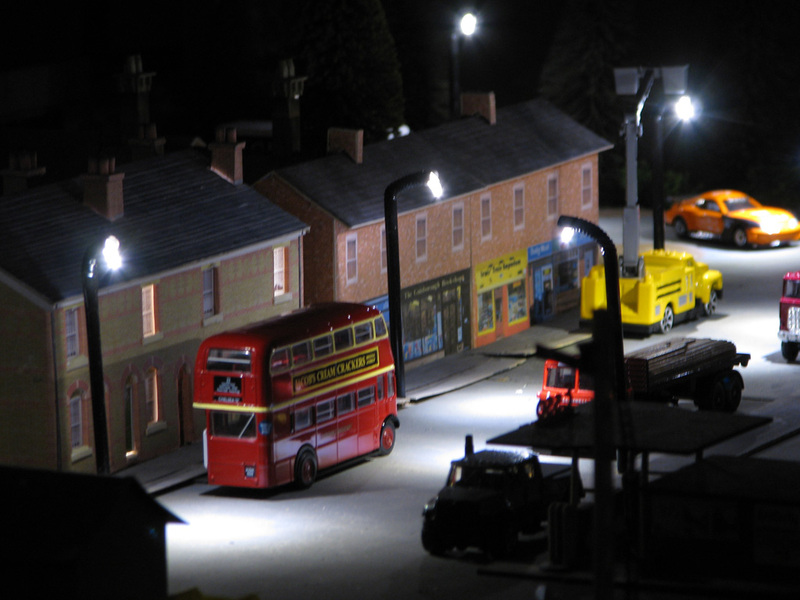 Some time ago when I first started building the model railway for my son I said I could add street lights to the layout. 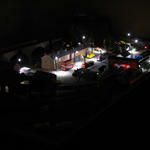 I duly spent hours making 2 very simple street lights, but this was somewhat lacking especially as they were quite dull. Today I finally removed them, and installed 20 white LEDs in street lights, station lights, and some interior lighting in buildings. These LEDs were prewired and had resistors fitted ready to use with 12V DC power (which I already had thanks to a left over Netgear router power supply), and cost less than buying the component parts to build myself. After 6 solid hours of work today the lighting is complete! 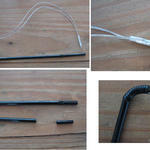 Take one bendy straw and trim it down to size. 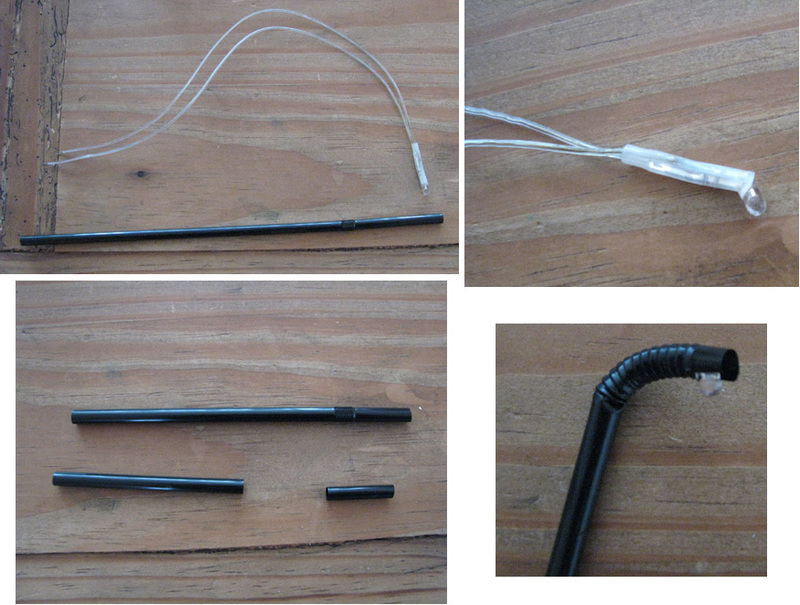 Bend a prewired LED, and slide into the straw. Street light complete The station lights are made the same way but with much shorter poles. 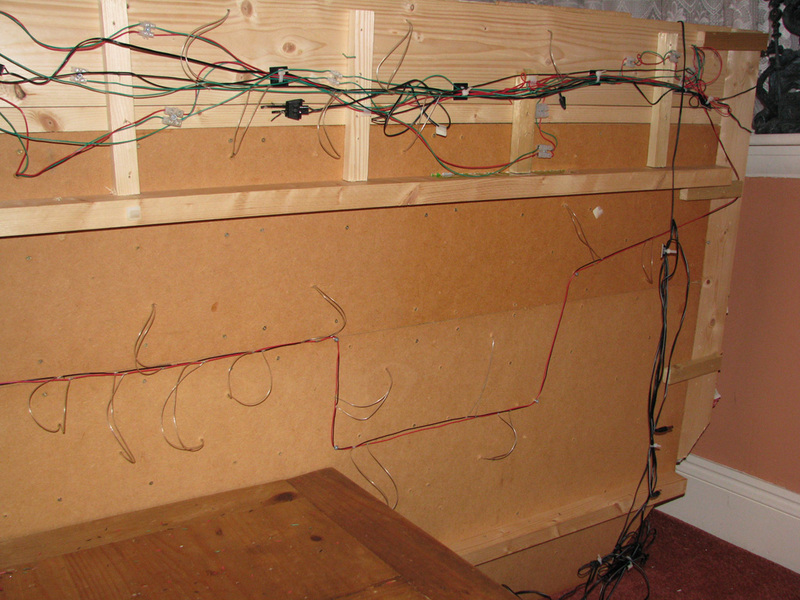 Holes were drilled and the wires fed through, and then two wires run around the underside of the board. 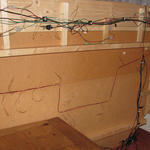 The LED wires were soldered to this wire by stripping little areas of insulation. 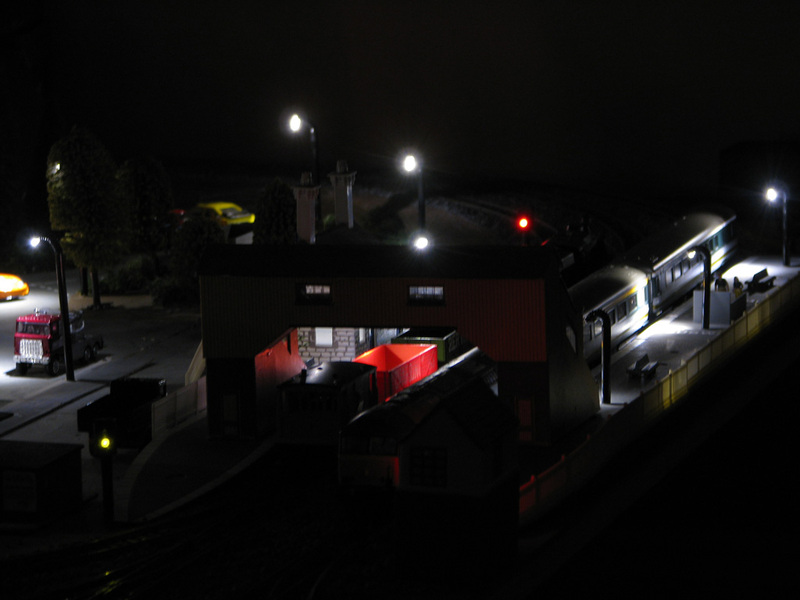 The red+black wire in the middle is for the street lighting, the station lights are run on a separate green+black feed - although you can't see those as all the other red+green+black wires for the track signals and isolated track sections are strung along the front edge next to them. 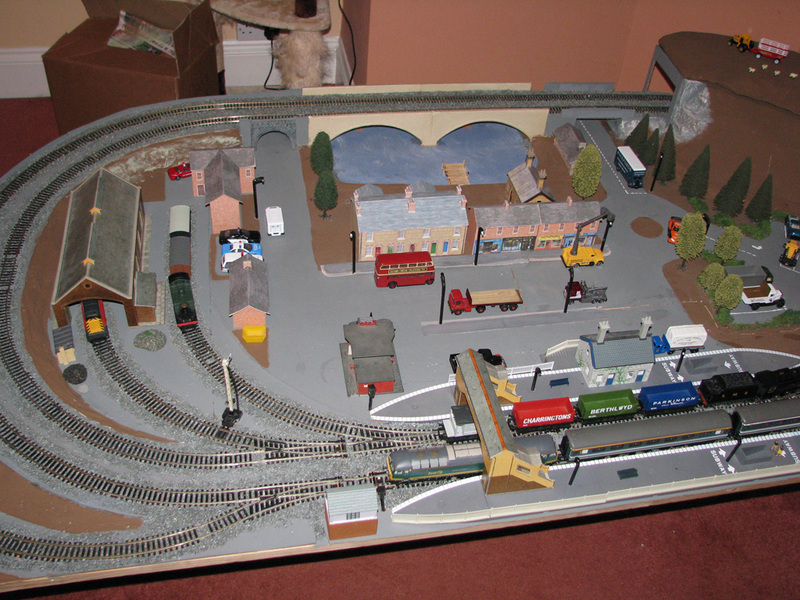 The layout was put back onto the small table and all of the scenery put back on. 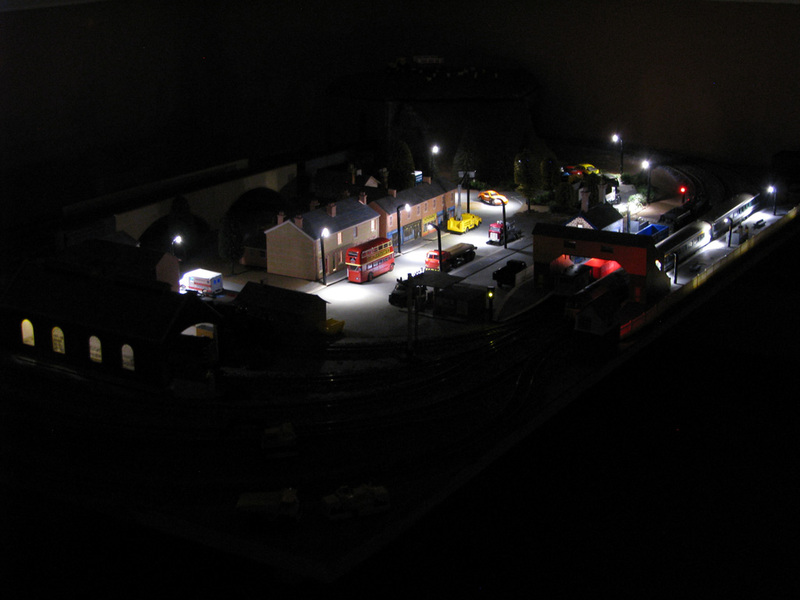 Here's the layout with the lights off. and with the lights on. 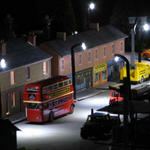 There are two lights in the terraced house behind the bus which can just be seen lighting the upper windows. There is one faulty LED - it keeps turning off and back on at random, possibly heat related, but at least it gives the lighting repair truck a purpose. 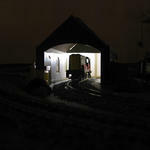 Close ups of the station, and the small diesel shunter in the engine shed. 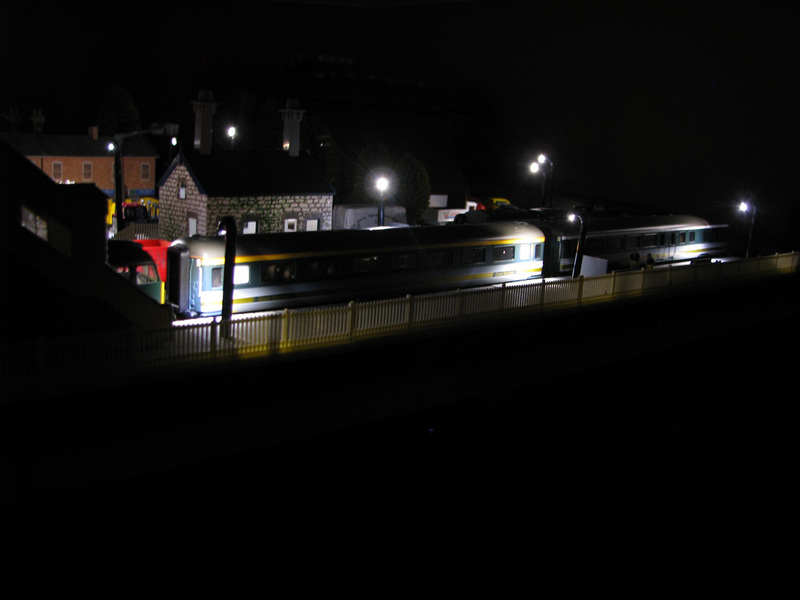 Next job will be to add some switches for the lights (right now switching on the power to the 12V DC supply turns on the street lights and the track signals, but the street lights should only be on at night), and then the scenery work can start. 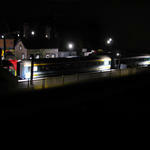 Last edited by Spack on Sun Nov 18, 2012 7:05 pm, edited 1 time in total. Kudos for the effort so far, the lights really look cool. 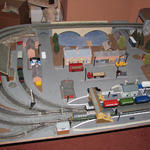 If you decide to start building a new layout, start as big as you possibly can. Wish I'd done a lot more research initially. I picked up some second hand parts from an open day at the local rail works that my son wanted to go to. This consisted of a bunch of old steel straights and curves, along with some nickel parts too. Top tip - don't buy old steel track! It's often rusty, and this interferes with the trains. I ended up replacing all of the steel track with new nickel track. I also decided to make a board that would fit under my son's bed, so was restricted to about 6' x 3'. I didn't realise how bad an idea this was until it was far too late. The smallest radius curves (aka 1st radius) have a radius of 14.6", so a half circle will be about 30" , which leaves little room on a 3' wide board. They're also only suitable for running small engines - a longer diesel or steam locomotive really needs at least a 2nd radius curve, and at 17.2" radius this won't quite fit on a 3' board as the track width pushes it over 36". If I could start all over again I'd use a baseboard at least 4' wide, and with 2nd and 3rd radius curves so longer engines and locos have an easier time. Bridges are also a pain. I have raised track at the back with a bridge made of out MDF - this has gone through loads of revisions, initially using Hornby incline piers, then blocks of wood, then mixed piers and wood, and so on. If you can avoid a bridge, do so. If you can't, try to design it so that the track itself is flat all the way around - raise the track up so that the bridge goes over a dip, rather than having inclines. The locos on my son's track have trouble pulling up the inclines with lots of carriages causing wheel slip, and in turn this causes a buildup of gunk on the wheels (dirt, charring from sparking, etc). It's also very difficult to get the incline angles right - the inclines on the track I built are a little too steep which was a necessity of the short board length, ideally they should be at most about half the ratio they are now. Figure in needing at least two full ovals (nothing worse than being able to run just one train at a time, my son got bored very quickly with that), and also points to add sidings and maybe to allow trains to switch between the ovals. If you don't use DCC also factor in multiple power supplies and electrical isolation to prevent shorting at points. Took me a while to figure out where to put isolating connectors but it all seems to be working ok, although I need to move one for a signal isolated section on the inner oval - this means soldering an existing isolated joint and using a dremel to cut another joint further along as I can't lift the track now it's all been ballasted. 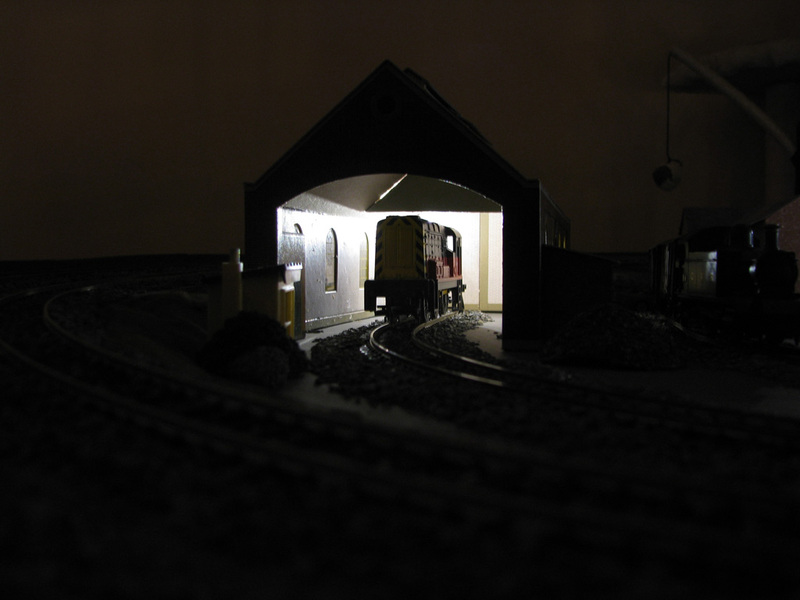 If I build a bigger layout I'll also look at using SEEP motors on the points so they can be controlled from a central point, rather than having to be switched manually. I did consider this for the existing layout but it's not really feasible given that it sits on a coffee table so there was originally no space under it to mount the motors, although I've added some 1/2" thick battens now that the underside is covered in wires for the lights. I'd recommend looking at SCARM (http://www.scarm.info/index_en.html) which is free, or AnyRail (http://www.anyrail.com/) which is commercial but the free version does allow enough parts to be placed to test out small layouts. Both of these I found useful (AnyRail mainly as it's simple to use) to track out different layouts to fit the board, and to figure out which track parts to buy. There are also lots of example layouts you can download and tinker with to fit your space which makes it much easier to come up with a layout that lots of features to keep interest going. 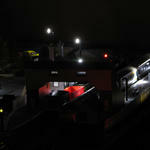 Last edited by Spack on Wed Nov 21, 2012 8:05 pm, edited 1 time in total. I have a small collection in storage that i got cheap when the shop closed mostly small loco's and rolling stock but I have got a mallard with 3 coaches (this is the bugger as it needs the long sloping curves) I have seen many people setup a hinged board with bridge on it, thats how I will think of closing the "loop" on my track - although actually wiring this all is going to be a pain. I also have to waterproof the shed. Turns out the shed is less waterproof than I hoped, so I need to try and make the roof more secure first.